In 2010 City of Sydney embarked on an ambitious water sustainability project for Sydney Park, located in the suburb of Alexandria in Sydney’s Inner West. 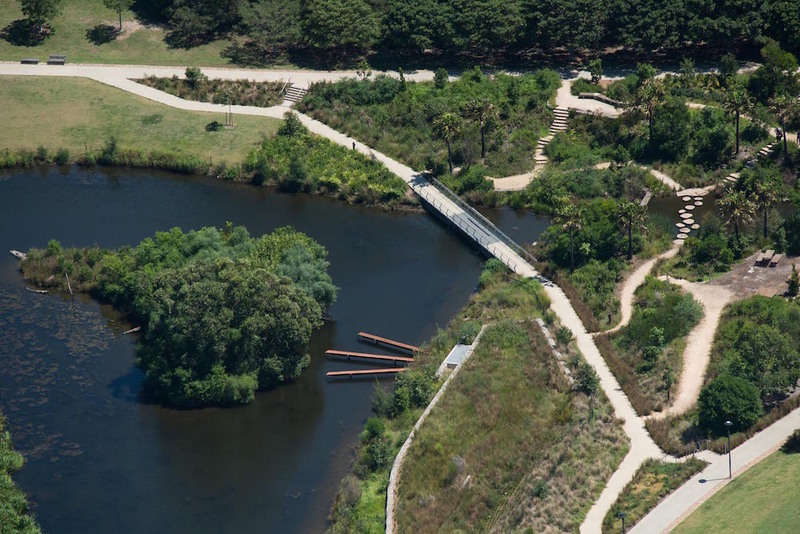 TDEP (Environmental Partnership’s Sydney landscape architectural collaboration – see Collaborations) has been responsible for development of masterplanning, design and tender documentation for this $11 million dollar project, the second stage of stormwater harvesting initiatives in the park. Commencing as a feasibility study, the project was developed in partnership with Sydney Water, Transgrid and the NSW Department of Environment and Conservation. Through it’s development the study assessed the viability of several ground water and stormwater harvesting options which were endorsed in 2007 by Sydney City Council. The first stage of works (completed in May 2011) harvests approximately 50 million litres of stormwater a year from the Barwon Park Road which included a diversion pipeline that directs flows through a gross pollutant trap, then enters the bio retention treatment system before being stored in the park’s wetland system. The second stage of the Sydney Park Stormwater Reuse Project delivers the City’s largest water harvesting infrastructure initiative to date and provide a significant contribution to the realisation of the Sustainable Sydney 2030 targets for local water capture and reuse. Turf Design Studio & Environmental Partnership have transformed the park, literally bringing the wetlands and the story of water treatment to life in the park’s ecosystems and in the community’s imagination. Through the chain of wetlands, connected by weirs, bridges, paths and stepping stones, the designers have created delightful places in the park’s landscape, connecting community and nature. The project is a key component of Sustainable Sydney 2030, harvesting stormwater from the Newtown catchment; the measure of 850 million litres/year. Water is captured, made good and returned viable through a dynamic and new waterscape; at all times connecting visitors to the water narrative of capture, movement and cleansing. The project now pumps up to 1000L/s of stormwater from Munni Channel into the Sydney Park water re-use scheme. This diverts an average of 840 ML/yr of stormwater for treatment and reuse. Water is diverted from the Munni Channel and pumped via a gross pollutant trap up to 200 metres to a series of bioretention beds covering approximately 5000m2 in total. The biorention beds flank 3 major wetland water bodies to which the filtered water ultimately drains. Water is reticulated between the lower and upper wetlands and is aerated through a series of cascades between the wetlands. In addition to their water quality function the cascades provide cool lush environments enjoyed by park users. The project has amassed international recognition, winning Platinum in the Landscape Architecture Award given by the American Architecture Prize. More on our projects for Parks and Open Space can be found here .